09/27/07 Weird Al Yankovic plays all the "hits" at The Riverside Theater. 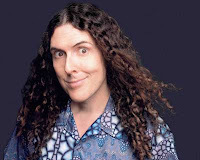 Weird Al is all good in my mind. I have never seen his band, but I have heard that they are tight. I do have a cassette from the 80's with a few funny songs. Some of the stuff he's covered is not all that great, but he seems to come back around and crush it once in a while. White and Nerdy is a song I love. He hit it out of the park on that one.